FOR THE RECORD: Rolando Larraz, the founder, the sole owner, the publisher, the Editor in Chief of this newspaper did not participate in any way shape or form in this editorial because he has been attacked, insulted, disrespected, humiliated, slandered and embarrassed by being taken out of the city council chambers by marshals following Councilwoman Lois Tarkanian’s orders, with the blessing of the Mayor and the entire board, and this editorial is in its entirety about the Councilwoman Lois Tarkanian. 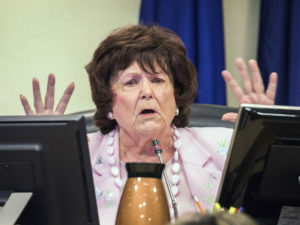 Councilwoman Lois Tarkanian has been the councilwoman for Ward 1 since 2005 — that’s fourteen years — but now, thanks to the term limit law, she is not allowed to run for office again. But Councilwoman Lois Tarkanian is already looking for a way to keep collecting a paycheck. A term limit is a legal restriction that limits the number of terms an officeholder may serve in a particular elected office. When term limits were started, it was as a method of curbing the potential for a monopoly, where an elected official effectively stays in office for life. Somehow the Senate and the House of Representatives were excluded from that office and that is why some members of Congress have been in office as long as half a century and no one complains or does anything about it. In local city offices the issue is different; the limit is three four-year terms and then out, even if the Nevada Legislature allows a member of the Senate that is termed-out to jump into the Assembly and vice-versa, just so they can stay in office longer. the impression that she would be part of the day-to-day Ward 1 business. Now another Councilwoman Lois Tarkanian’s longtime friend and assistant since she was elected in 2005, Robin Munier, has announced her candidature for Councilwoman Lois Tarkanian’s seat, creating an advantage of two people getting elected for that seat. We find that move despicable and insulting to the people of Las Vegas, and specifically to the people of Ward 1. Amy Tarkanian most likely will follow the rules and ideas of her mother-in-law, allowing her to participate in meetings and preparing her for the twice-a-month board meetings at least for the first one or two years in office until she gets used to the office or until her mother-in-law gets another government job — whichever comes first. Robin Munier already knows the ups and downs of the office and most likely already knows “the tricks of the trade” and has the cell phone numbers of the wheelers and dealers her boss already dealt with on a daily basis. We believe that the constituents of Ward 1 should open their eyes and remember that once a political candidate takes office, they become a different person and they will not be on their side. Ward 1 needs a new city council — not a continuation of City Councilwoman Lois Tarkanian. They need a new independent city councilwoman in that Ward. As a matter of fact, this is the opportunity for the people of Las Vegas to clean house, Wards 1, 3, and 5 plus the mayor’s seat are up for grabs and the people have the chance to balance the board with new and fresh individuals who are able to serve the entire city with dignity and honor to the best of their abilities. For the last three months we have been working on how we can be more proactive and we promised our readers that we are ready for three new city council seats and one new mayor who does not know how to correct the board members’ errors and mistakes with just a simple apology. We see this city election as an open door to take down those who see us as peasants and disrespect us under the umbrella of being above the law and above all ethics and professional behavior and never once even thinking of retracting their words or apologizing for their arrogant behavior.